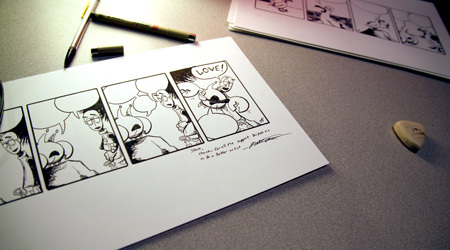 You can own your very own original piece of Robot Pirates comic art! Each strip is a hand-drawn, one-of-a-kind piece of art which is lovingly crafted on high quality Vellum Bristol board using archival inks. Robot Pirates comics are sized at 4.5″ X 12″. Each strip is hand signed and dated. Because Robot Pirates is lettered and colored digitally, I also include a full-color signed print of the final image. 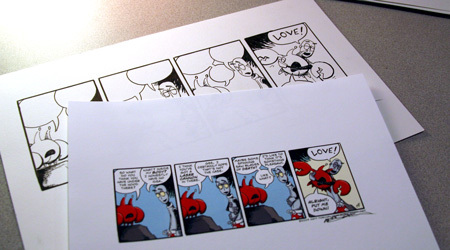 Each comic is reproduced in high-quality on heavy gloss-finish paper. 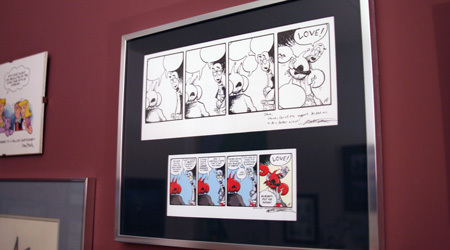 These strips frame up beautifully* and are a great addition to every collection. So make your friends and co-workers insane with jealousy and get your own original piece of Robot Pirates today! Each original comic strip and color print is only $50 and shipping is FREE! (Additional shipping costs may be required for those outside of the United States.) To purchase a comic, simply browse the archives and click on the “Buy Comic” button under the comic of your choice, then follow the instructions from there.